Familiar cities, longstanding events and the return of a number of well-known venues will highlight the 43rd annual Drum Corps International Tour. Kicking off on June 17, 58 drum corps will travel the country to compete in 105 events in 37 states, before the 53-day summer tour concludes at the DCI World Championships in Indianapolis this August. 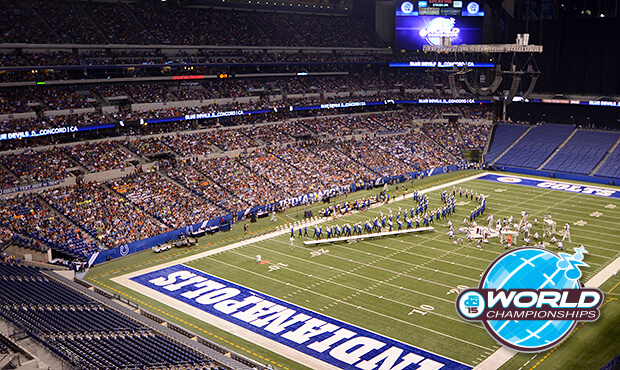 "The location of the World Championships in Indianapolis as an annual event has provided tremendous opportunities to achieve stability in the scheduling process across the entire DCI Tour," DCI Executive Director and CEO Dan Acheson said. "For both the performing drum corps and their fans, knowing what to expect assists with cost-savings and travel planning, from supermarket locations for the food service teams to housing and rehearsal locations for the performers to favorite restaurants and hotels for families, friends and fans." Drum corps fans can watch the opening event of 2015 live from Lucas Oil Stadium or in movie theaters across the country. As it did in 2014, the Drum Corps International Tour will kick off in the same city it will end, with a lineup of the Blue Stars, Bluecoats, Cadets, Carolina Crown, Cavaliers and Madison Scouts competing in Indianapolis on Wednesday, June 17. Adding to the excitement of opening night, the "DCI Tour Premiere" will be staged in Lucas Oil Stadium and will be broadcast live for the very first time in movie theaters across the country. The following weekend will include stops in Kentucky, Ohio, Michigan and Illinois, adding the Boston Crusaders, Crossmen and Troopers to the lineup of corps from opening night. Competition on the West Coast will get underway on June 19 in Clovis, California, with the longstanding DCI West event returning to Stanford Stadium on Saturday, June 20. California corps will welcome Phantom Regiment to their home state this summer, when the Illinois corps tours the West Coast after recent visits in 2008, 2011 and 2012. In the last decade Regiment has traveled west more than any other Midwestern corps, which Executive Director Rick Valenzuela says is in part at the suggestion of his corps members. "In a year-end survey we always ask our members to fill out, the West Coast is consistently noted as a location of where they'd like to tour most," Valenzuela said. "The weather is always great and the crowds always have so many fans." The DCI Tour will return to Minneapolis on July 11 after a scheduling conflict caused the event to be relocated last summer. Anchoring the DCI Tour schedule mainly on weekends and in some of the biggest and most popular venues of the summer, will be Drum Corps International's Premier Event series. This year's schedule will include many longstanding locations in addition to the return of a number of familiar stadiums. The first week of July will be marked with the celebration of the Boston Crusaders' 75th anniversary, during which the DCI Tour will return to Gillette Stadium in Foxboro, Massachusetts, for the first time since the venue hosted the 2005 World Championships. The Blue Devils—who will be in California just days earlier—will fly to New England in order to take part in this special event scheduled for Thursday, July 2. It will be the first time this summer that last year's World Champion corps competes against the Cadets and Carolina Crown. Like the Blue Devils, Santa Clara Vanguard will also put a number of miles on the odometer at the beginning of July to get to the Midwest in time for events in Kansas, Iowa and Wisconsin. After a scheduling conflict caused its relocation in 2014, the second weekend of July will bring the popular DCI Minnesota Premier Event back to TCF Bank Stadium in Minneapolis on Saturday, July 11. 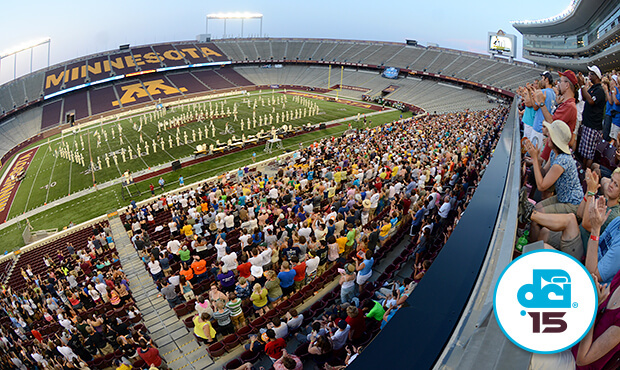 "The lineup of 18 World, Open and All-Age Class corps headed to the University of Minnesota will be the biggest to this point on the 2015 Tour," DCI Director of Events Susan Kuehnhold said. Simultaneous to the Minneapolis event on the 11th, the longstanding Drums Along the Rockies competition will be back at Sports Authority Field in Denver. In addition to the Blue Knights being back in their hometown, this year's event will bring the Bluecoats to Mile High for the first time since 2009. On Sunday, July 12, the 2015 Tour of Champions (TOC) event series will kick off in DeKalb, Illinois. Debuted in 2011, the TOC gives fans the opportunity to immerse themselves in the drum corps experience as corps members meet and greet spectators as they enter the venue and perform as small ensembles throughout the stadium. Comprised of the top seven scoring corps at last year's World Championship, this summer's TOC will also feature a rotating lineup of guest corps as part of the eight-event series. The annual southwestern leg of the DCI Tour gets underway on Thursday, July 16, in Denton and in a new event presented by Band Shoppe at the University of Mary Hardin-Baylor in Belton, situated between Austin and Dallas. 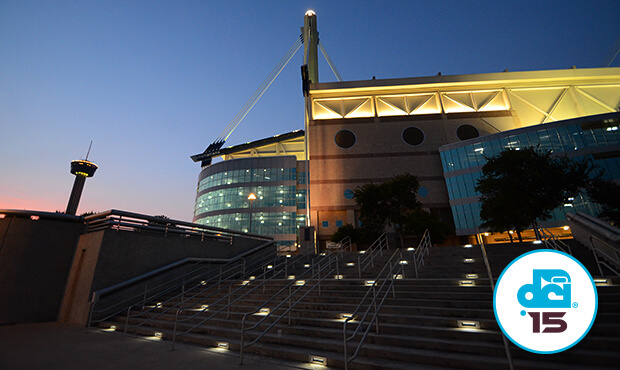 The San Antonio Alamodome on Saturday, July 18, gets the honor of hosting the DCI Southwestern Championship presented by Fred J. Miller, Inc., that will feature all 22 of DCI's World Class corps along with a number of Open Class groups. After a final Texas showdown in Dallas on July 20, most corps will head southeast with stops in Little Rock, Arkansas, Hattiesburg, Mississippi, and Huntsville, Alabama. All of those roads will lead to Georgia for the DCI Southeastern Championship in Atlanta, but not before the tour will head to the Nashville area on Friday, July 24. Details regarding the venue for this Tour of Champions series event are still pending. With construction underway in downtown Atlanta for a new multipurpose football stadium anticipated to open in 2017, the DCI Tour will get a few more years in the familiar confines of the Georgia Dome on Saturday, July 25. Always one of the best-attended events of the summer, the Southeastern Championship will be the last time before the DCI World Championships in August that all World Class corps compete as part of the same lineup. The last weekend of the regular season will showcase World Class corps at venerable J. Birney Crum Stadium in Allentown, Pennsylvania, split over two days of competition on Friday, July 31 and Saturday, Aug. 1. Order two-night ticket packages to the 2015 DCI Eastern Classic in Allentown. 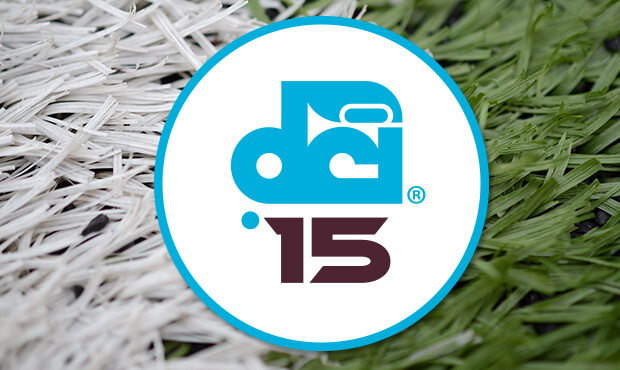 Serving as waypoints between the Premier Events will be the bulk of the 2015 DCI Tour schedule. Sanctioned events in cities like Fairfield, Ohio and Ocean Springs, Mississippi create the additional performance opportunities necessary for DCI's corps to travel safely and efficiently from one competition to the next. "We can never thank our national network of Tour Event Partners enough as they work to produce, promote and manage the events that create so many additional opportunities for spectators to see drum corps perform in their local communities," Kuehnhold said. The excitement of DrumLine Battle and SoundSport returns to downtown Indy on the day of the DCI World Championship Finals. Drum Corps International's week-long series of World Championship events will get underway in Michigan City, Indiana, on Monday, August 3, when Open Class corps begin their run for the title. Following the preliminary competition, the top 12 corps will advance to the Open Class Finals on Tuesday, August 4, where the 2015 Open Class Champion will be determined. After Michigan City, Open Class corps will join their World Class counterparts Wednesday in Indianapolis when the annual DCI Performers Showcase presented by System Blue gives individuals and ensembles from participating corps the chance to show off their talents throughout the streets of downtown Indy. Heading to Lucas Oil Stadium on Thursday, August 6, the World Championship Prelims will feature a massive lineup of Open and World Class corps competing head-to-head, all eying the opportunity to advance to the Semifinals competition on Friday, August 7, that will feature the top 25 scoring corps. 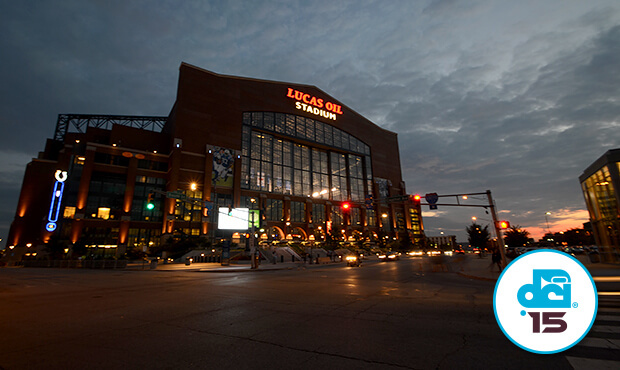 2015 will mark the seventh straight time that Indianapolis will host the DCI World Championships, and this year, Lucas Oil Stadium will tie Madison, Wisconsin's Camp Randall Stadium as the most visited World Championship venue in DCI's more than 40-year history. 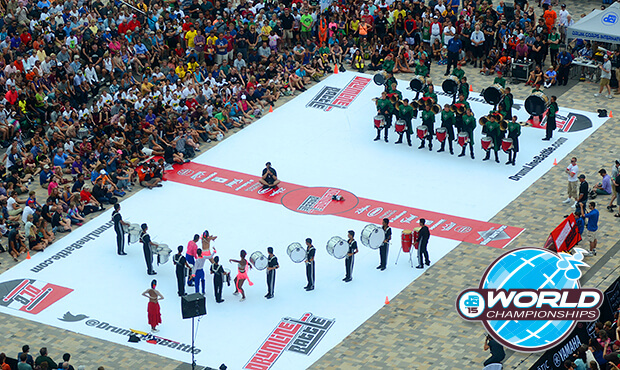 Prior to the start of the World Championship Finals the evening of Saturday, Aug. 8, will be the return of SoundSport and DrumLine Battle events. The wildly popular competitive musical showdowns will pit an exciting array of drum corps, local, independent and even international groups against one another on intimate performance stages situated on downtown Indianapolis' Georgia Street and Pan Am Plaza. "The expansion onto Pan Am Plaza in 2014 was a huge success, receiving rave reviews from nearly everyone," DCI Director of Business Development John DeNovi said. "The performers, fans and supporting partners were delighted by the festive atmosphere and large crowds, and it's only going to keep getting better as more teams participate and additional fans choose to round-out their Championships experience by enjoying the intense energy from these up-close performance formats." Starting Monday, December 8, tickets to more than 20 of the most popular events of the 2015 DCI Tour will go on sale through the DCI Box Office and Ticketmaster. Events will include the DCI Southeastern Championship at the Georgia Dome and single-night tickets to the 2015 DCI World Championships in Indianapolis. Sign up for Drum Corps International's "Box Office Alerts" to receive e-mail notification when tickets to 2015 events near you will be going on sale throughout the winter months. All 22 of DCI's World Class corps will compete head-to-head at the San Antonio Alamodome on Saturday, July 18. 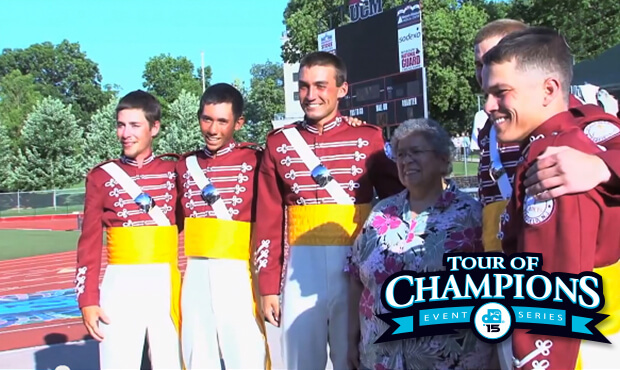 The Tour of Champions event series gives spectators a chance to experience drum corps up close. Lucas Oil Stadium will host the DCI World Championships for the seventh straight year this August.